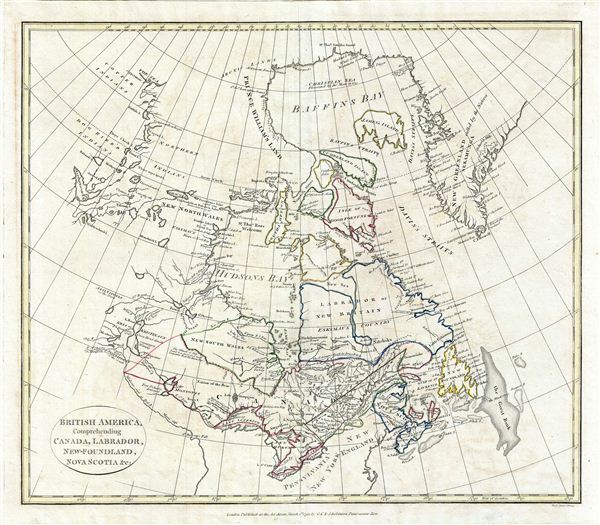 British America, Comprehending Canada, Labrador, New-Foundland, Nova Scotia &c.
An unusual and appealing 1799 map of Canada by the english map publisher and religious scholar Clement Cruttwell. Centered on the Hudson Bay, Cruttwell's map embraces the territory from the Arctic Ocean and the Baffin Bay southwards to the Great Lakes and from Great Slave Lake (here called Arathapescow Lake) to Greenland and the Grand Banks. The map features a wealth of detail throughout the region offering comments on climates, the navigability of various rivers, political boundaries, roads, and indigenous cultures. Although not specifically named, Cruttwell incorporates the explorations of Samuel Herne (working for the Hudson Bay Company) along the Coppermine River and his sighting of the Coronation Gulf at roughly 70 degrees north latitude. The whole exhibits delicate outline color and fine copper plate engraving in the minimalist english style prevalent in the late 18th and early 19th centuries. Drawn by G. G. and J. Robinson of Paternoster Row, London, for Clement Cruttwell's 1799 Atlas to Cruttwell's Gazetteer. Very good. Original platemark visible. Original centerfold visible. Minor toning overall. Boston Public Library, Leventhal Collection, G3400 1808 .N44x.